Prayers for Lisa Marie Presley, her children, and her family/loved ones. Recently it has been (sadly) reported on and on about the details of Lisa Marie’s divorce proceedings. Having young children, and some over 18, divorce/custody issues are NEVER “fun”. It takes tolls each minute of each hour of each day. Lisa Marie Presley has to be strong for her children as their mother and her decisions will affect each of them throughout their lives. I hope others will pray for Lisa Marie Presley and her family as well as for our fellow man. This world needs more forgiving, love, empathy, etc. for each of us carries the weights of our decisions. Our actions. And our choices even when there is only one “choice”. We are so “busy” and inundated with bad news/evil far and away, we don’t convey our thanks/love to one another or to our maker which everything flows from. I added this, after thought and prayer, true story for context and the hope it will lead to more understanding. More support. More prayers. etc. At nine years old, after staying with her father over summer break, on August 16, 1977, couldn’t sleep. Her father came into her bedroom, where Lisa was on her white oval shaped bed and consoled her – kissed her forehead – and said goodnight. Hours later Lisa Marie learned of her father’s death through the wailing of her grandfather Vernon, the cooks, members of the Memphis Mafia, etc. it was chaos. Little 9-year-old Lisa Marie picked up the red phone in Gracelands kitchen by the 4 closed circuit cameras (black and white) and put her finger into the first hole (of the telephone number) and repeated this 9 times. 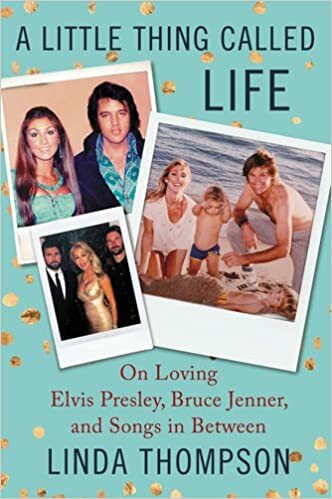 Linda Thompson, who had been Elvis’ girlfriend from 1972 (approx) until 1976, answered and heard Lisa Marie say “my daddy’s dead…my daddy’s’ dead”. Linda asked to speak to an adult and confirmed this nightmare was real. Grown men, with various black belts in the martial arts, wept and fell to their knees crying. Vernon was inconsolable and he was frail due to his age and deteriorating medical issues. Women were in a state of shock but still tried to comfort Lisa Marie. At times Little Lisa Marie tried to comfort her grandfather but he was unable to respond as his heart was literally…broken. Lisa Marie was surrounded by men and women she knew and scores of others she did not. She was told her mother, and Linda Thompson was flying into Memphis. Lisa asked if her father would be back from the ambulance ride. Over the next (approximately) year she would see her grandfather Vernon (sadly) die. She attended his funeral a little more mature knowing the finality of death which she endured so many feelings/emotions/loss of her father’s death. Lisa Marie was traumatized x 10000. Legally her mother, Priscilla, now became the executor of Elvis’ estate as Vernon had died and everything went to Lisa but she was a minor so until she was 18 Priscilla would oversee everything. When her 18th birthday came she wasn’t ready so she let her mother run things until Lisa was 21. At 21 she still wasn’t able so it was extended until Lisa was 25 years old. Immediately upon her father’s death, there were stories written, tv shows about, newspapers full of, etc. the attacks (by so many through decades upon decades ) of hearing so many accused her father of being a drug addict. That he tried to kill himself. That he was really still alive. Lisa Marie is a talented, smart, and loving mother to her children. She never asked for this. Does anyone know how much time it takes to get over your father’s death? Or how that affects one’s decisions? One’s life? The same questions about her grandfather Vernon’s death? Keep in mind this was a very close family who openly shed tears for the death of Elvis and then Vernon. These tears were not limited to August of 1977 as for many they continue through the typing of this post. I wish Lisa Marie, and her family, happiness – success – good health – stability – long life, etc. and that this divorce, and the monetary aspects, gets resolved very soon. Lisa Marie, like all others, should garner our sympathy and support for life is so very…very short. When one, as this has been my experiences, falls in love and then marries before men/witnesses/God it is a beautiful thing. To have children born out of this love is a blessing. Hence, it is horrendous to have to go through divorce proceedings not only for the “adults” but also for the minor children. No amount of money will heal the (temporary and permanent) scars on ones’ emotional state, mental state, physical state, parental state, and even the monetary state regardless of one’s last name (which in this case is beloved but brings forth far too much scrutiny, chatter, gossip, etc.) so facts and context matters but always secondary to what is right including the respect and appreciation we each should have for all of our fellow men including Lisa Marie. Lastly, I don’t ask (with all sincerity and humility) others to pray, support, show compassion about. not feed into hurtful statements, etc about Lisa Marie Presley because of her name but…in spite of it. There are many friends, and authors who eloquently have written about this aspect of Elvis’ life, (i.e. Marty Lacker, Red West, Sonny West, Alanna Nash, Billy Smith, Joe Esposito, Jerry Schilling, etc.) who were with Elvis when Priscilla was pregnant (from May 1, 1967 to February 1, 1068) – when Lisa Marie was born – and for the 9+ years Lisa Marie was with her Father (as he sadly died on August 16, 1977). There is not a shred of a doubt that Elvis loved Lisa Marie from; the moment it was confirmed Priscilla was pregnant, to every kick and movement during those 9 months, to the deliver (note: back then the man was not allowed in the delivery room and they had to wait in a designated “waiting room”). Also, in southern culture (which I know firsthand and is a prominent place of where I come from and how I look at certain things especially respect, admiration, appreciation, etc. for women) the Father was kept from seeing his wife and newborn child until both were cleaned up and “presentable”. Furthermore the Father, in this case Elvis, was given strict instructions about Priscillas expected recovery time which Elvis not only took to heart but he had a deeply held belief that God gives life through the mother and that her body is literally a sanctuary and the relationship between man and wife can change (still loving and caring but “different”) once a child is born. Priscilla and Elvis married both wanted children but I don’t believe that Priscilla envisioned that she would become pregnant on her honeymoon. Thus, this celebratory time in their life soon turned to semi-bedrest and after the birth months of recovery. Priscilla becoming pregnant was a great joy in Elvis’ life and he was a loving, concerned, and proud expectant Father. He doted on Priscilla and together they chose names should it be a son and/or a daughter. 1967 was a turning point in Elvis’ life as he was on the cusp of getting out of his movie contracts, that had been in place since his release from the US Army whereby Elvis starred in (approximately) three movies per year and had stifled Elvis’ creative juices and kept him from appearing before a live audience something that he truly loved…and needed, and he was in better physcial shape. But he, nor anyone else, had any idea that within the next two years he would catapult back into the forefront of the musical world and renew his superstardom first by his 1968 Singer TV Special (by the talented Steve Binder) entitled “Elvis” and then his successful return to live performances starting in Las Vegas. Lisa Marie was the greatest love of Elvis’ life. She had the best of Elvis’ features as well as those of her stunningly beautiful mother Priscilla. She was quick witted, smart, and (like her Father) seemed to be always on the move. Thankfully, Lisa Marie has shared many of her stories/recollections about her and her beloved Father (i.e. in videos, books, interviews, photographs, etc.) which I encourage everyone to seek out and enjoy. The photographs taken of Elvis and Priscilla in the hospital with newborn Lisa Marie show a smiling, animated, laughing, and joyously proud Elvis who took to holding, and fonding over, Lisa Marie like he had done it his whole life. Of course Priscilla looks beautiful and her smiles are equally bright and the love she has for her daughter is evident in every breath… every movement. Writing this blog will never do justice to the love Elvis had for Lisa Marie. I think their love was beautiful, consuming, unique, and eternal. I believed that he loved her so much and that when the marriage between Elvis and Priscilla began to deteriorate it adversely effected Elvis every moment of his life. I don’t believe Elvis ever thought that he would bring a child into this world and not be able to spend their lives together with an enduring triangle of love cemented by an ever present Mother and Father. Lisa Marie has been blessed to have her own children who I am sure she loves greatly. Lisa Marie is a multi-talented woman who is sensitive, regal, and in so many ways strong/brave/fierce. She is married to Mr. Michael Lockwood since 2006 and by all accounts they are happy, committed, and loving parents. I wish her and her family all the best in life. Elvis spoiled Lisa Marie with gifts, attention, freedom, etc. I believe he did this, in part, because of his childhood growing up with love but also in adjunct poverty. Also, I believe Elvis (like many of us do) had an internal clock that was known only to Elvis but precipitated his intentions and his actions. Perhaps it was because his mother died on August 14, 1958. For whatever reasons Elvis, as he did in every aspect of his life, did what he thought best and the end result was that he raised (along with Priscilla) an exceptional woman in her own right. I believe that Elvis Presley was a good Father. That he showed his love to Lisa Marie and that his love has, in part, sustained her throughout her life. Lastly, I believe that true love is not only essential but never ending. That true love is not defined by geography, time, space, or presence. That true love is the greatest gift God bestowed to us other than his son, Jesus. I believe that the love between Elvis and Lisa Marie exists to their very day and that, as it should be, it belongs between them. ** Note – though I possess many photographs of Elvis with Lisa Marie I made a decision decades ago that it is not my place to show them to the general public. That the only person who should control those moments encapsulated on film (i.e. photos and videos). I am also very appreciative to Lisa Marie for giving of her time to Elvis Presley fans worldwide and to carry on supporting worthwhile charitable endeavors as Elvis did throughout his life. Thank for your visiting our site and please let others know about our blog, and websites, via social media.